1. Bring a medium saucepan of water to boil. Boil rice vermicelli 3 to 5 minutes, or until al dente, and drain. 2. Fill a large bowl with warm water. Dip one wrapper into the hot water for a couple second to soften. Lay wrapper flat. 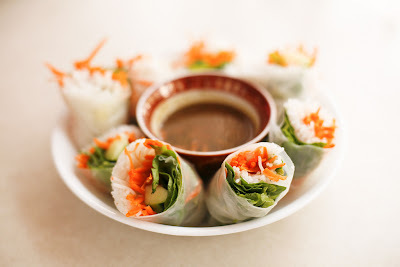 In a row across the center, place a handful of vermicelli, carrot, cucumber, basil, mint, cilantro and lettuce, leaving about 2 inches uncovered on each side. Fold uncovered sides inward, then tightly roll the wrapper, beginning at the end with the lettuce. Repeat with remaining ingredients. Wow, Jacklyn! Definitely have to try thiiiiis! If I ever stop being lazy, that is. Aww don't be lazy..its so easy! try it!